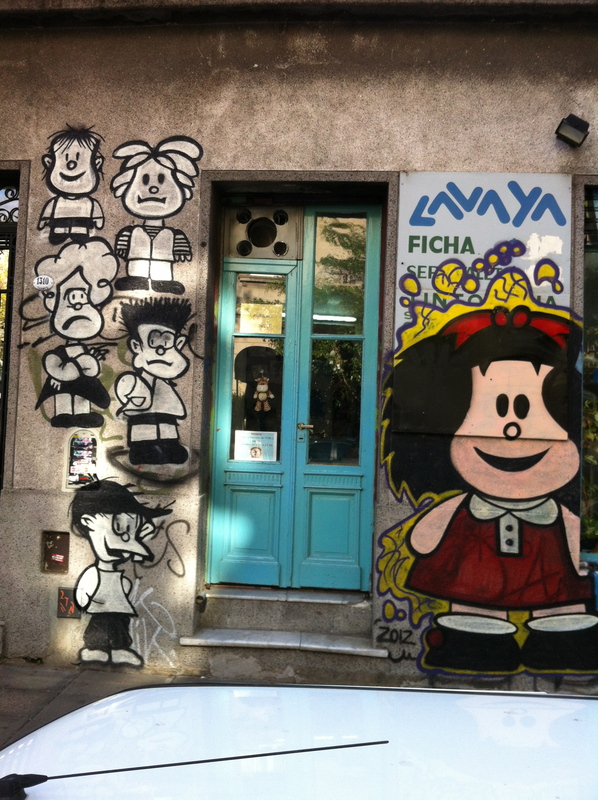 An hommage to Mafalda seen in the streets of Buenos Aires. Mafalda is on the right and some of the characters are on the left. Inauguration of the Mafalda statue in San Telmo. You can go take pictures with her. Of course, there is always a line. 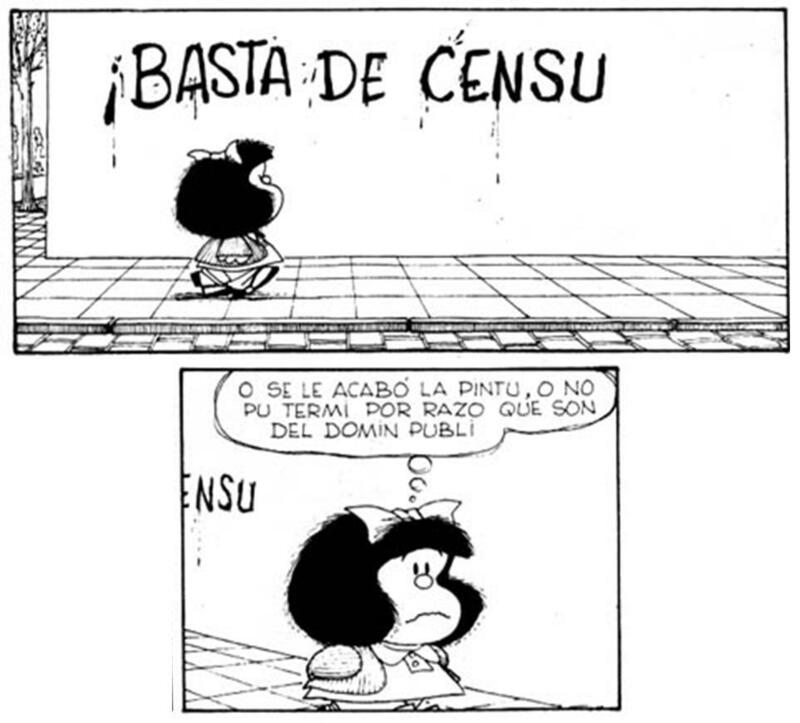 Mafalda is amazing. Mafalda is like the Calvin and Hobbes of Latin America. I could say she’s like the Charlie Brown and the comic is like Peanuts, the comic focuses on a group of children and it has that height of celebrity, but, to be honest, Mafalda is way too spunky to be Charlie Brown. She’s smart and sassy. She doesn’t take sh*t from no one. She questions authority, life, and the meaning of the universe. But she’s also a 6 year old girl who has a hatred for soup. Written by the Argentine Joaquín Salvador Lavado (pen name Quino) between 1964-73, Mafalda deals with the social and political turmoil of those years with an innocence and humor that is quite obviously contagious. 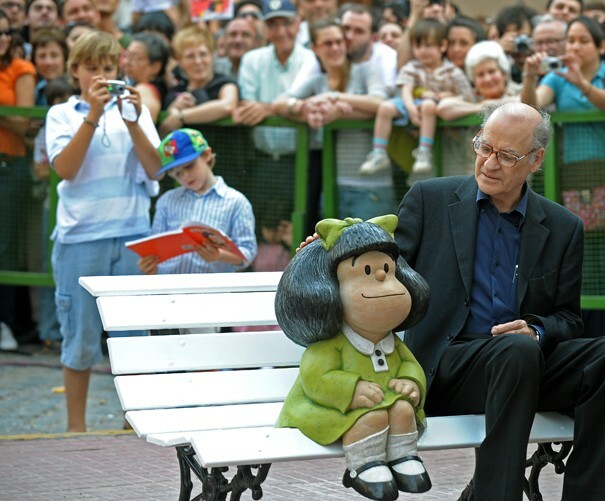 The cast of characters includes Mafalda and her friends along with the adults they come in contact with. Since its inception, Mafalda’s face has been plastered across newspapers, movies, and cartoons. Her image has been used to promote everything from clothes to cookies. She has been immortalized as a statue in the historic district of San Telmo where hundreds of people go every day to have their picture taken. And it’s not just in Argentina where she is popular. You ask almost anyone in South America about Mafalda and most likely a smile will break out on their face. Before we came down to Argentina, some friends gave us an almost complete series of the Mafalda books to help us prepare for our adventure. As my spanish is getting better, I’m slowly making my way through them. It’s not always easy because comedy is often a play on words and my words, even in my own language, aren’t always easy coming. But Mafalda is a really fun way to practice and is a fantastic way to become more familiar with the culture and history of Argentina.